On a quiet autumn day at Whaleback Vineyard, the tasting room is empty of visitors. Outside, rows of grapevines sit in repose, quiet but for the breeze rustling through the dense forest that borders the vineyard. But a quiet day in the off-season hardly means things aren’t humming at usual speed. In the nearby barn, owner and winemaker Dennis Brown Jr. is busy with the tasks involved with fermenting, aging and bottling the vineyard’s 11 varieties of wine. Grapes can’t be stored into the winter the way apples are, so the harvest month of September was one of almost nonstop work for Brown and his wife, Amy Ray. “We were pretty much going crazy for a month, crushing the grapes immediately,” Brown recalled. The life of growing grapes and transforming them into wine, he explained, requires an ever-evolving to-do list. “In reality, I could spend six hours a day just in the winery taking care of things,” he said. Aside from crushing grapes and overseeing the fermentation process, there’s the business of keeping all 28 of the winemaking tanks clean. This involves transferring wine from one tank to another to remove layers of fruit sediment. Finally, there’s the bottling process, the majority of which takes place in the winter. “I started out with a plan where we’d have a couple of months off in the winter, but it hasn’t worked out that way,” Brown said with a chuckle. 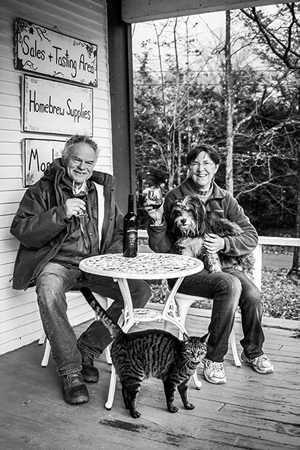 Brown and Ray opened the vineyard for business in 2009, when Brown, now 67, realized it was time to expand his sideline of winemaking, fulfilling a lifelong passion that took root in childhood. He made his first batch of wine at age 10 on the very same land where the vineyard sits today. “Back then, it was an experiment with brown sugar and raisins,” he recalled. His repertoire later evolved to include wine made from the wild grapes that grew on his family’s farm as well as dandelion wine. The hobby continued to expand with the encouragement of family and friends who enjoyed his wine. Brown estimates it was about 23 years ago that he first started hearing about hardy northern grapes being grown in Wisconsin and Minnesota. The 11 varieties of wine he makes fall into the categories of red, white, rose, fruit, dessert and ice wines. Most are grape-based, but some include blends of local apples, peaches, pears – and even Vermont honey. Ray said it’s hard to choose a favorite from her husband’s wines. Whaleback’s winemaking business has grown steadily over the past decade, but in the past couple of years the family enterprise has taken on a new dimension. It had become evident to Brown and Ray some years ago that the vineyard’s historic barn, built in the late 1800s, was in need of repair. The towering red “bank barn,” so called because it’s built into the side of a bank, was purchased in the 1950s by her husband’s parents, the late Lenora and Dennis Brown Sr., who operated a dairy farm on the property for decades. Ray said the entire family swung into action to help save and renovate the barn. Their eldest daughter, Jacinda, even set up a Go Fund Me page in 2015 to raise funds for supplies for the restoration project, which took nearly two years. Structural repairs included reinforcing the walls and re-planking the floors. Ray said their intent was to fortify the structure while maintaining the barn’s original appearance and character. The bottom portion of the barn, which was once a milking parlor, is now where the winemaking takes place. But the ground-level area, which once stored farm equipment and hay, was bestowed with a new and unexpected purpose in the midst of the renovations. The couple’s youngest daughter, Sadie, was issued a most unforgettable marriage proposal by then-boyfriend Allen-Glen Burnell. With Dennis and Amy’s blessing, he created a massive white “Will U Marry Me?” inscription on the barn’s south-facing exterior. When Sadie said yes, the two decided the barn would be the perfect location for the wedding. And from this simple twist of fate, the barn was given a new incarnation as an event space. As it turns out, maintaining the barn’s original architectural integrity proved beneficial to holding weddings there. The “Will U Marry Me?’ inscription went over so well, with both Sadie and subsequent visitors to the vineyard, that it has remained as a permanent fixture. On the front-facing side of the barn is another white inscription: ‘Love,’ befitting of the barn’s new purpose. After the winter bottling concludes, Brown will focus on assessing any vine damage in the spring and begin pruning the nine acres of grapevines. The physical labor involved with the spring pruning is daunting, though. Whaleback Vineyard -- named for a hill on the property that looks like a whale’s back surging out of the water -- continues to be a family affair. Ray works full time at an area school but pitches in with duties ranging from pruning and sales to pouring wine for visitors to sample. Sadie and Allen-Glen help out as well, and Jacinda, who now has a teaching job out of state, handles social media, serves as scheduling coordinator for special events, and visits often during peak season to help in the tasting room. Set in a white clapboard farmhouse with a wraparound porch, the tasting room and retail space offers space for sitting, while another room displays items such as locally made artwork, crafts and maple syrup for sale. Customers routinely take their wine samples out to sip on the porch, which offers panoramic views of both the vineyards and Green Mountains in the distance. The bottles retail for $15 plus tax and are also sold at area liquor stores and farmers markets, including year-round on Saturdays at the Rutland farmers market. “We don’t ship at this point, but we might someday,” Ray said. During late fall and winter, the tasting room is open from 11 a.m. to 5 p.m. Friday through Sunday. The hours expand in the spring and summer months. 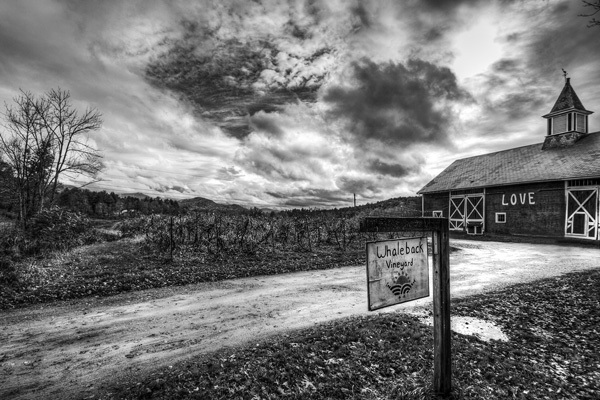 For more information about Whaleback Vineyard, visit www.whalebackvineyard.com or call (802) 287-0730.